Hoarseness is a general term which describes abnormal voice changes. When hoarse, the voice may sound breathy, raspy, strained, or there may be changes in volume (loudness) or pitch (how high or low the voice is). The changes in sound are usually due to disorders related to the vocal folds which are the sound producing parts of the voice box (larynx) (see A). 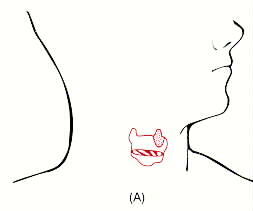 While breathing, the vocal folds remain apart (see B). When speaking or singing, they come together (see C), and as air leaves the lungs, they vibrate, producing sound. The more tightly the vocal folds are held and the smaller the vocal folds, the more rapidly they vibrate. More rapid vibration makes a higher voice pitch. Swelling or lumps on the vocal folds prevent them from coming together properly, which makes a change in the voice. A common cause of hoarseness in older adults is gastroesophageal reflux, when stomach acid comes up the swallowing tube (esophagus) and irritates the vocal folds. Many patients with reflux related changes of voice do not have symptoms of heartburn. Usually, the voice is worse in the morning and improves during the day. These people may have a sensation of a lump in their throat, mucous sticking in their throat or an excessive desire to clear their throat. Hoarseness due to a cold or flu may be evaluated by family physicians, pediatricians and internists (who have learned how to examine the larynx). When hoarseness lasts longer than two weeks or has no obvious cause, it should be evaluated by an otolaryngologist-head and neck surgeon (ear, nose and throat doctor). Problems with the voice are best managed by a team of professionals who know and understand how the voice functions. These professionals are otolaryngology-head and neck surgeons, speech/ language pathologists, and teachers of singing, acting, or public speaking. Voice disorders have many different characteristics which may give professionals a clue to the cause. Specialists in speech/language pathology are trained to assist patients in behavior modification which may help eliminate some voice disorders. Sometimes, patients have developed bad habits, such as smoking or overuse of their voice by yelling and screaming, which may cause the voice disorder. The speech/language pathologist may teach patients to alter their method of speech production to improve the sound of the voice and to resolve problems, such as vocal nodules. When a patients problem is specifically related to singing, a singing teacher may help improve the patients singing techniques. ©1994. American Academy of Otolaryngology-Head and Neck Surgery, Inc. This leaflet is published as a public service. The material may be freely used so long as attribution is given to the American Academy of Otolaryngology- Head and Neck Surgery, Inc., One Prince Street, Alexandria, VA 22314. Read Dr. Levy's article on Hoarseness, Doc, Why is my voice so hoarse?